The 150th anniversary of Carl Nielsen’s birth gives record labels and concert planners a chance to put more of the great Dane’s music before the public. The symphonies are reasonably well represented on disc and I’m hearing more of them on BBC Radio 3, but it’s the lesser-known Nielsen that’s likely to prove most revelatory. That’s certainly true of his ‘ardent, apple-cheeked’ Songs for Choir, which I reviewed recently. I’ve also been working my way through Alan Gilbert’s set of Nielsen symphonies, and while I found it intermittently impressive my overall impression is not terribly positive. That’s also the case with the first release in Oramo’s BIS series, which I felt didn’t augur well for the rest of the cycle (review). I fervently hoped this second instalment would be very different. 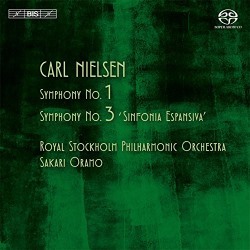 Nielsen’s First, completed when he was in his twenties, is a remarkably assured work whose see-sawing lyricism and fierceness should make for a thrilling ride. The danger is that unless it’s boldly drawn this symphony is apt to sound random or rhetorical (compare Gilbert); it only takes a few minutes to realise that Oramo doesn’t fall into these traps. Yes, he is crisp and incisive, but there’s a world of difference between that and the relentlessness of those who simply push too hard. Something else that’s crystal clear at this early stage is that Oramo has a marvellous sense of the music’s architecture, both internal and external. Moreover, the Stockholm orchestra respond to his direction with playing of terrific passion and bite. Goodness, this is a Nielsen First to sweep listeners off their feet and blow old favourites into the proverbial weeds. I recently had occasion to commend BIS for their bar-raising sonics, and I must do so here as well. Punishing dynamics and a wide, deep sound-stage make this the most immersive and exciting version of this symphony that I know. By contrast the tensions generated in Gilbert's account seem curiously synthetic. Interpretively Oramo’s Allegro orgoglioso is like no other; indeed, he brings a Carlos-Kleiber-like intensity and grip to the music-making, while also allowing Nielsen’s reflective passages to breathe and bend most beautifully. Seldom have I heard a classically-aligned work teem with such temperament and still retain its graceful proportions. That sense of scale is carried over into Nielsen’s trenchant tuttis, which blaze but don’t self-immolate. The Andante, its dark surge and retreat so compellingly realised, also shows what a fine orchestra this is; all sections excel, while individual timbres are superbly caught. Ironically, it’s Oramo, not Gilbert, who conveys that daring, caught-on-the-wing feel of a live performance. The latter’s risk-averse reading of the First simply doesn’t do it justice. I felt Oramo was inclined to parenthesise in his Nielsen Fourth and Fifth, but there’s absolutely no sign of that here. His Allegro comodo is a case in point; seamless, engaging and perfectly paced the music brims with a boisterous character you won’t hear in Gilbert’s recording. I find the latter just too calculated for my tastes, so Oramo’s more easeful – and illuminating – method is most welcome. Even that fiery finale is shaped and projected in such a way that it never sounds overly insistent; and what lovely, confident woodwind playing, febrile strings and rampant brass. The taut and commanding timps must be mentioned in dispatches, too. Oramo’s Nielsen Third is no less gripping. Those assertive, hammering figures in the Allegro espansivo and the music’s restless nature are nicely presented. The climaxes are convincingly built, too; indeed, here and elsewhere there’s something of Ole Schmidt’s ability to range and terrace the music, and that makes for a most imposing edifice. Oramo’s also alert to Nielsen’s opposing rhythms – now rippling, now raucous – and that adds to the sense of a riveting dialogue. There are no fumbles or pauses in the conversation, but then this is an impassioned and highly literate debate from start to finish. The Andante pastorale must be one of the most striking things Nielsen ever wrote, and this radiant reading – with its meadow-haunting vocalise – surely confirms that. Even the hint of a gathering storm à la Beethoven or Berlioz can’t dispel the music’s mood of contentment. The pure-toned soprano and baritone soloists are ideally blended and balanced. After that the Allegretto strides forth in its seven-league boots, and Nielsen’s interlocking musical ideas click neatly into place; alas, that's not always the case with rival performances, Gilbert's especially. Frankly, if one had any doubts about Oramo’s credentials in this repertoire his bold, expertly crafted finale should dispel them for good. It was rash of me to dismiss Oramo’s Nielsen cycle on the basis of its first instalment, for this follow-up is everything that one wasn’t. Put bluntly, you won’t find more compelling and better recorded performances of these two symphonies than this. This is a field-leading release, both musically and sonically; roll on Two and Six.